I'm going to go in a different direction today, and get a bit personal. 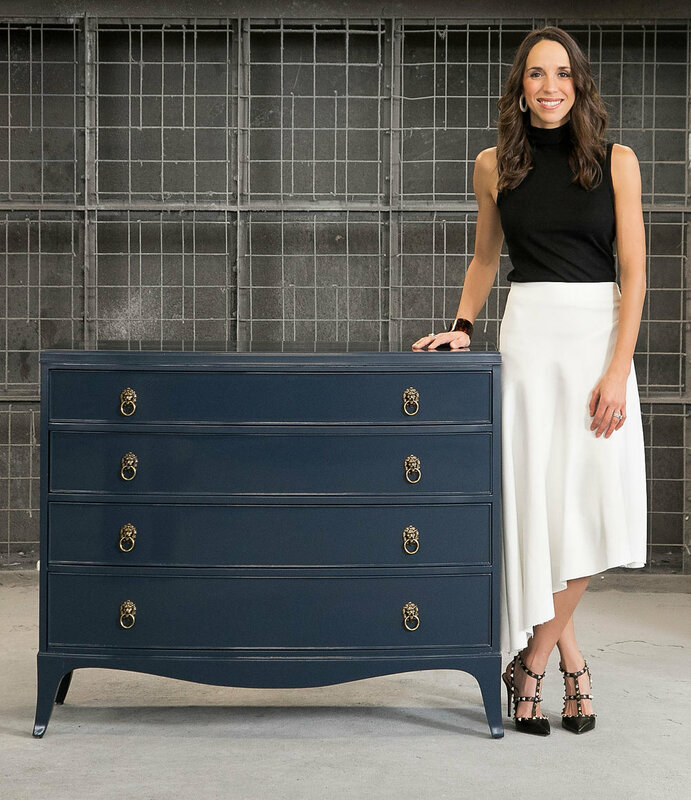 I know many of you probably read the title of this post and immediately thought I'm referring to the foundation of Vintage Refined - giving furniture a second chance. After all, that's our core business here. However, this post goes deeper, to exactly what second chances on a personal level mean. Today, we're talking about life. You often hear phrases like "You've only got one chance at life, so don't screw it up" or "There is no dress rehearsal for life". While these phrases all have truth behind them, what they aren't mentioning is the fact that even if you end up on the wrong road, it's never too late to take back control of your life and steer it into a meaningful direction. One of the perks about my job is the opportunity I get to constantly work with talented, creative individuals in the design world. There is nothing more inspiring and motivating than to see the work of others, and to watch how they can turn a blah, boring room into a space that is nothing short of stunning. I have been fortunate to be able to collaborate with some of the top designers in Chicago and to watch how they have transformed people’s spaces into their dream homes. Do you feel like as you get older, there are fewer events in life that you really get excited for? For example, my 36th birthday came and went a couple weeks ago, and I barely remembered to celebrate. On the flip side, there are some events, that as I age, I seem to anticipate more and more…my monthly massage, 4th of July, and…the annual announcement of Pantone Color of the Year! While it may seem like insignificant news, in the design world, this one announcement has a trickle down effect that impacts major decisions in the years to come. So, when the Pantone Color of the Year is finally released, you can only hold your breath and cross your fingers that it’s a color you’re excited about and anxious to incorporate into your style. And in my opinion, 2019 did not disappoint. Happy New Year! 2017 was definitely a memorable year over here on both a work and personal level. On the work side, Vintage Refined continued to grow, specifically gaining a greater presence in Chicago. I was lucky enough to work with some really great clients who continue to challenge our creativity and capabilities. In my personal life, we moved into a new home and I became a mother (to more than just dogs). Looking back, it's no wonder this year flew by. It's going to be a tough one to beat, but 2018 is already off to a great start. I've had some exciting news that I've been eager to share with you, and can finally do so. It's been one of my personal goals for awhile, and I can finally check it off my list; our lake house was featured in the magazine This Old House! Over the past couple years one of my main focuses has been renovating and decorating our homes. I have spent more hours than I'd like to admit pouring over design magazines, home furnishing catalogs, decorating websites, and of course making the occasional shopping trip or two. Furnishing a home can be an expensive endeavor, and through this process, I've picked up some tips and have gained a bit of knowledge that I thought I'd pass along to you. Now if this were a post about tips to creating a beautiful home with endless funds, this would be a list of 60, and not six. Unfortunately, that's not the case over here, or in most situations. For those of you familiar with the site Everything But the House, that title is pretty fitting for our dining room, however it'd be changed to Everything But the Furniture Store. That pretty much sums up where our dining room furniture came from. Auctions, check. Estate sales, check. Craigslist, check. Seriously, where is the fun in walking into Pottery Barn, pointing to a dining room set, and declaring, "I'll have that one."?! C'mon, waaaay too easy. For those of you who have been following me for awhile now, you know that's not really the way things work over here, especially when you have the talented resources I have at my fingertips. Since moving into our new home, I think I've become my #1 client, taking advantage of the full gamut of services. A couple weeks ago I made reference that I had some exciting news to share, and because of it, there would be a lot of interior decorating inspired posts coming up. Well, here is the first of many! However, I should probably take a step back and fill you in on the details. After nine plus years of living in our condo, we finally decided it was time to say good-bye to high-rise living and move into a single family home. It was a big change, and there are many things we are missing about condo life - smelling what our neighbors were eating for dinner, waiting 10 minutes every morning for an elevator, receiving dirty looks when we let our dogs run around the lobby off leash, and being woken up at 3 am by our 20-something year old neighbors after a night out. (I'm laying on the sarcasm here if you can't tell)! Yep, it was a hard choice all right, but we were ready! Oh hey, guys! Remember me?! Yeah, it's been awhile since I've posted a new blog, I know! Things have been crazy busy over here, and it seems like every time I've sat down on my computer to write a post, I've gotten sidetracked with responding to customers, scheduling deliveries, listing new items in my shop, etc., that by the time I'm finished with that, I'm spent! There's been some other exciting things going on over here as well, and I'll be sharing more about that soon. To give you a hint - there will be A LOT of interior design / home decor posts coming up. Yes, these are all good problems to have, and you're not hearing me complain, but I really do miss my blogging! It's been a couple months since I kicked off the Bucktown project, and I thought we were due for an update. If you missed the first part, you can get up to date here. We've made some significant progress, and things are slowly starting to come together. We were hoping to have things wrapped up by late March so everything was settled by the time the baby arrived, but apparently the furniture industry doesn't work around due dates and when they say it takes 10-12 weeks for a couch to arrive, you wait patiently. So, let's take a look at where we are today.